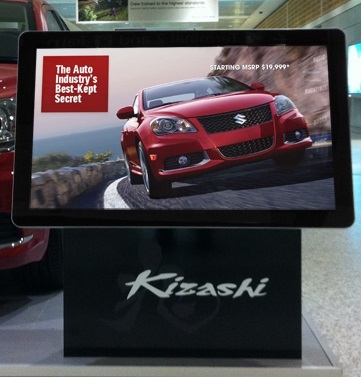 Digital signage can give your exhibition stand the edge over your competitors. The clarity of the image and the interactive element attract visitor attention in a crowded conference hall and make your booth area stand out. As an added bonus, the software used for digital signage is slick and easy to use, enabling you to revise your message without the cost or time involved in traditional print production. 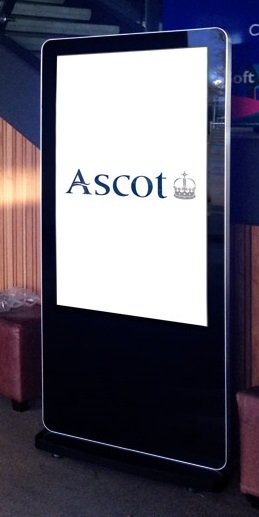 Digital signs or screens were first introduced more than 20 years ago. At the time, the hardware was expensive so growth in usage was slow. Yet, over the years, the cost became more affordable. As a result, this high-impact form of visual marketing has grown in popularity and is increasingly being used at exhibitions and in the retail sector. While the hardware for today's digital signage is far more affordable that in the past, it is still a considerable investment. If you are only going to use your sign once or twice a year at trade shows, renting is a viable option to save money. In addition to trade shows, digital screens can be used in a variety of ways to deliver your marketing message, making the hardware purchase more cost effective. Reception areas, showrooms, customer centers, shopping malls, and event rooms are excellent venues for their use. The average lifespan of digital displays is around 50,000 hours, giving you years of use and savings on traditional print media over this time. There are two types of sign hardware you can purchase: networked or plug-and-play. Choosing whether you go for a networked digital solution or a simple plug-and-play sign depends on what information you are going to display and how you are going to upload and update it. These are updated with information from a standard USB drive. USB digital standalone signs are the simplest. Everything you need to display static or moving content is built into the screen. You don’t need an internet connection – just a power source. You create your content, which can be static or moving, in programmes such as Photoshop or PowerPoint. Then you save it to a USB drive. Simply insert the USB into the digital screen and the built-in media player will take care of the rest. Once your USB is removed, your images and videos will play in a continuous loop. You will have a limited ability to schedule times for different content to display during the day, but no real time control. If you have multiple screens, you will have to take the USB and plug it into each one, which means this solution is preferred if you have one or just a couple of units in a single location. A networked solution gives you more flexibility to expand the number of screens, update them remotely, and use more interactive content. While it is slightly more complicated to update information compared to plugging in a USB drive, this option is still a straight-forward process. Once your screen is connected to the internet, either by a LAN or Wi-Fi, you simply login to a cloud based CMS (content management system). Your content, which has been created in Photoshop or other content creation software, is then uploaded via the network to multiple locations and screens. A content management system allows you to use the screen in a more engaging way. Rather than just showing a loop, you can design templates so the screen can be divided into a number of zones. Each zone can be used to display different content. So images, video or even your website could be displayed at the same time. You may have screens that use live content to engage viewers. This is possible by subscribing to a feed provider, which allows you to display live information using widgets to display weather, news, time and dates, as well as your own content. To accommodate changing needs, you might be in the position where a plug-and-play solution is the right choice for your current situation, but think you would need to move to a networked solution in the future. If this is the case, look for a supplier who can offer screens that are upgradeable. To make the switch, there is typically an upgrade fee. Then, you will need to change the settings on your displays to convert from a plug-and-play solution to a fully networked one.